Created and Performed by Ashby Blakely, Caroline Bower, and Biniam Tekola. 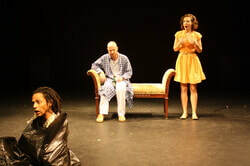 Creative Loafing's winner for Best Original Play 2010. Todd is gay, and his wife Lois is losing her mind, so why shouldn't they adopt a teenage somalian pirate? Surreal, sharp edged and timely; Mum's the Word is an absurdist take down of the privileged class at the end of the world.